Help support Everglades protection and public education by raising awareness for this vital natural resource! 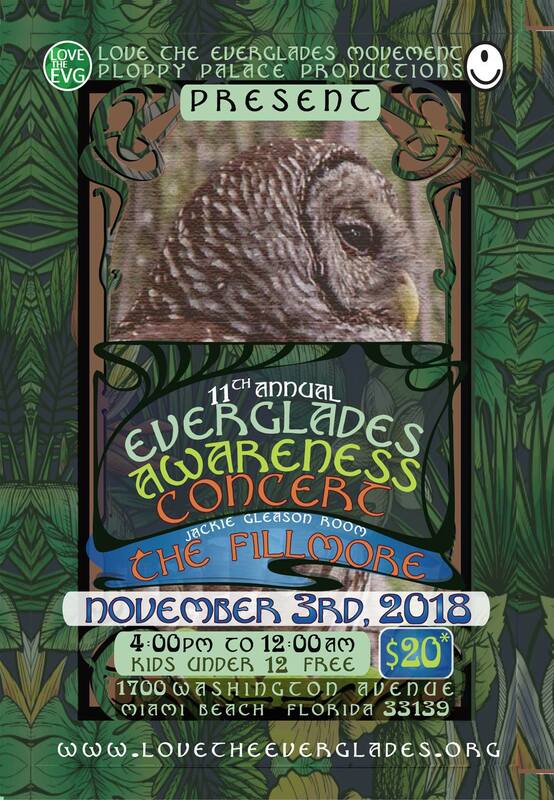 Love The Everglades Movement and Ploppy Palace Productions will be hosting a concert to raise awareness and support for Everglades protection and public education. 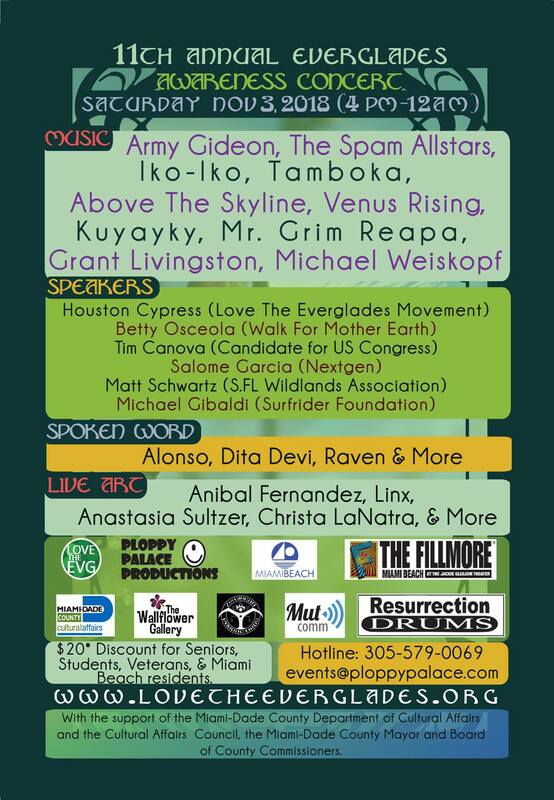 As part of this multi-media extravaganza, some of South Florida's top bands, spoken word artists and community activists will join together to raise awareness for this vital natural resource. Digital art show, information booths, face painting & kids activities! Admission is $15 pre-sale plus fees, $20 at the door, $5 discount for Miami Beach residents, veterans, seniors and students. Checks Payable to: Love The Everglades Movement, Inc.
Love The Everglades Movement is hosting a special Everglades Clean-Up! We will gather at the Miccosukee Resort at 3 pm. We will meet at the back portion of the parking lot towards the far right end and then caravan together to the canal cleanup site, on the Tamiami Trail near ValueJet memorial site. We will supply a water cooler for cold water refills, gloves and garbage bags, but feel free to bring your own work gloves if you have them. The Everglades Clean-up is an opportunity for direct action that brings people into the Everglades to remove garbage and invasive plants. This hands-on excursion will connect individuals and communities to the wilderness and waterways by providing education and experiences. This gathering will be open to people of all ages and offer a chance to interact with nature beneficially. We invite individuals and other organizations to come together and make a difference. As a not-for-profit organization with the State of Florida, Love The Everglades Movement can sign for community hours. If you would like credit for participating in the Earth Day Everglades Clean-Up, please provide the paperwork required and it will be filled out at the end of the event. We are happy to provide an outlet for civic engagement and we encourage positive volunteerism on behalf of the Everglades. We appreciate your effort! 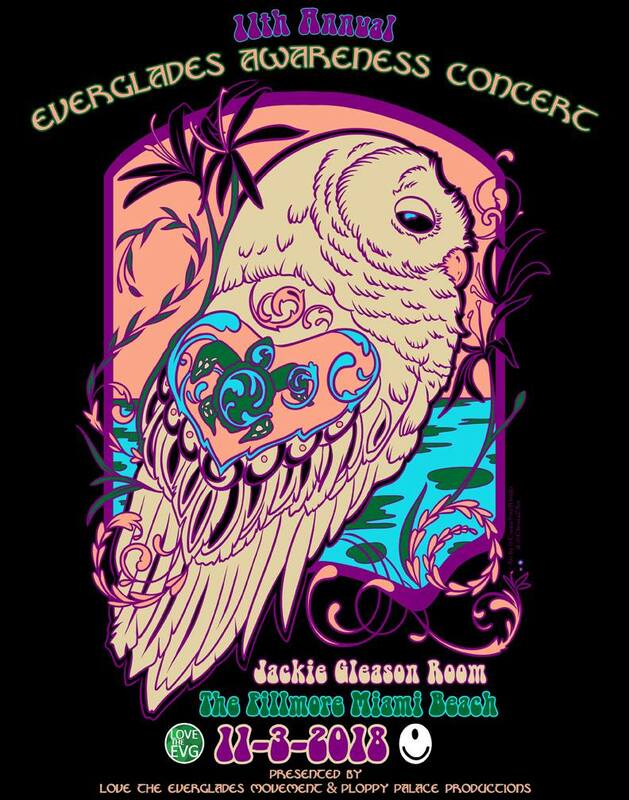 Love The Everglades Movement (LTEM) is a multi-faceted environmental organization that works to bolster public support for the Everglades with community events. As an organization that utilizes a full spectrum outreach format, LTEM combines education with the arts, spirituality and the inclusion of diverse communities. Our goal is to empower people and provide outlets to protect the Everglades and our natural resources. With the support of the Miami-Dade County Department of Cultural Affairs and the Cultural Affairs Council, the Miami-Dade County Mayor, and Board of County Commissioners.